Pound-for-Pound king and new WBA/Ring Magazine lightweight champion Vasyl Lomachenko may have just had the toughest fight of his pro career thus far but don’t go expecting the 30 year old great to take a long rest. 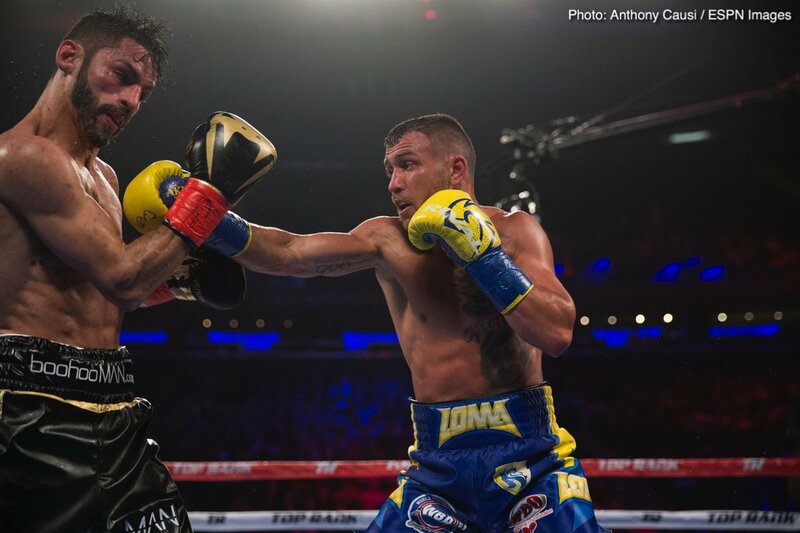 Lomachenko, who may have hurt his shoulder slightly in Saturday night’s brilliant fight with the also-excellent Jorge Linares, will return to action on August 25, so says promoter Bob Arum. The opponent is likely to be reigning WBO 135 pound champ Ramundo Beltran who will be making the maiden defence of the belt he won back in February with a close decision win over Paulus Moses. According to Arum, and as reported by RingTV.com, Lomachenko, 11-1(9) will fight next at The Forum in Inglewood, California, once again on ESPN. So while Lomachenko awaits the winner of the July showdown between WBC champ Mikey Garcia and IBF ruler Robert Easter, he will look to earn the other available lightweight belt. But Beltran, though he will be a considerable underdog in the fight, will not let go of his prize easily. It’s a great thing for the hard working, old-school Beltran that he has got himself this fight (most likely he has it, not yet 100-percent official), and with it a career-high payday. The teak-tough, fight-anyone warrior who has made a habit of taking fights in another guy’s backyard has earned it. READ Vasyl Lomachenko/Anthony Crolla This Friday – What Can We Expect? So can 37 year old Beltran, 35-7-1(21), who is rarely stopped (just twice, the last time a decade ago), give Lomachenko a tough night – can he even beat him? As was the case in the Linares fight, Lomachenko will be giving away size and reach against Beltran, who has a good punch, an even better chin and a great workrate. Feder points out how his fighter went the full 12 rounds with Terence Crawford, who is now a full welterweight – “he’s [Beltran] the only guy Terence couldn’t get rid of,” he said. So can Lomachenko get rid of Beltran, or will the older, bigger man be able to make it a street fight the way he wants to do and make such an approach work for him? Chances are we will find out on August 25. Next boxing news: Left-Hook Lounge Mailbag: Lomachenko, P4P List, & Bradley v Broner!